Air pollution is one of the major causes of cancer revealed International Agency for Research on Cancer (IARC) an arm of United Nations World Health Organization (WHO). According to the agency data in 2010 worldwide totally 223,000 people have died of lung cancer that is caused by air pollution and also it increases chances of bladder cancer. The pollution is similar to that of passive smoking which could cause cancer said Kurt Straif, the chief of IARC. "The air we breathe has become polluted with a mixture of cancer-causing substances" he said. 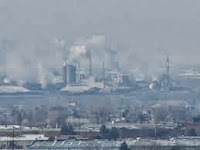 The transport, emissions from factories and farms, power generation, cooking and residential heating are the prime sources of air pollution that can cause cancer according to IARC.